This morning I was awoken bright and early by the sunlight streaming through my window and I instantly knew today was going to be a good day. The grey clouds have appeared overhead now but I managed to squeeze in an early morning trip to the florist to pick out some pretty flowers & then came home to make some chocolate cupcakes with extra chocolate icing. Yummy! Yum! Those cakes look all kinds of deliciousness! This post is so sweet, what lovely way to spend a saturday! p.s your cupcakes look yummy! Awe that sounds like a lovely day! 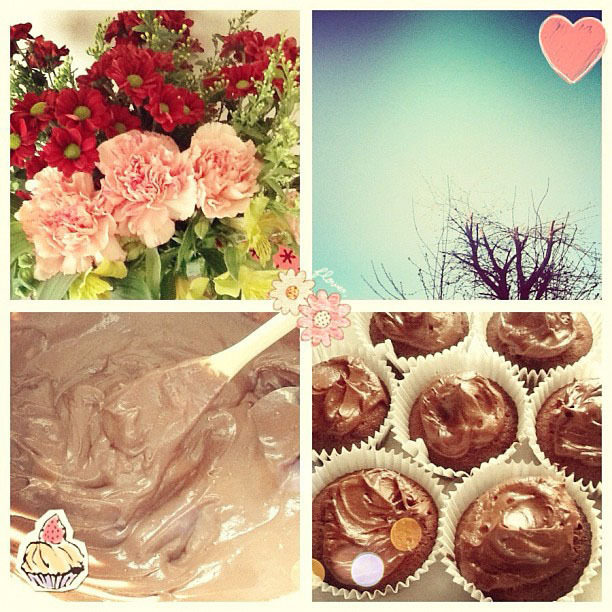 The flowers are beautiful, and those chocolate cupcakes look yum yum yum!